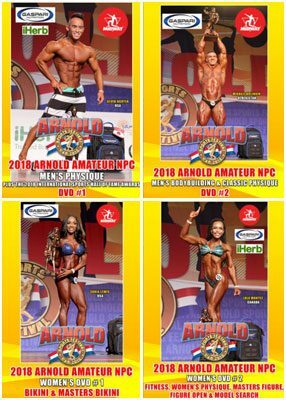 2018 Arnold Amateur NPC DVD collection. VIDEO FILES: YOU MAY ALSO ORDER AN HD VIDEO FILE OF ANY CLASS OF YOUR CHOICE INCLUDING THE CLASS AWARDS, TO BE EMAILED TO YOUR INBOX, US$40 PER CLASS. See the lineups, comparisons and callouts for all 6 classes. All awards are also included through to the OVERALL AWARD to Kevin Nguyen, MEN’S PHYSIQUE CHAMPION for 2018. The second part of this DVD contains the full event of the 2018 International Sports Hall of Fame Inductee Ceremony. >> Read more…..
Mikhail Volinkin of Uzbekistan won the overall Men’s Bodybuilding title. More than 600 of the top amateur competitors from around the world competed in 10 divisions at the 12th Annual Arnold Amateur NPC International Championships. >> Read more….. This Women’s DVD presents all of the classes of the BIKINI and MASTERS BIKINI contests. 2 IFBB Pro card were awarded being to Bikini Class “C” winner Ashley Blair and to the overall winner Sonia Lewis. >> Read more…..
Christelle Zarovska of the Netherlands won the overall WOMEN’S PHYSIQUE title as more than 600 of the top amateur competitors from around the world competed in 10 divisions. This DVD presents all of the classes of the PHYSIQUE, FITNESS, WOMEN’S OPEN & MASTERS FIGURE, and MODEL SEARCH. >> Read more…….